Alpen Long-Life hammer action drill bits are profile milled as with SDS bits and offer a high-performance tungsten carbide drill bit set. To stay in number one spot internationally, drill manufacturers like Alpen must keep developing, upgrading and looking at new innovative products continually. All Alpen drill bits are produced in Austria in the most up-to-date plants, working to the highest quality standards under the strictest quality controls. The result is international top-quality products. Alpen demands the same of their production as they do of their tools, it must be efficient, economical and state of the art. To ensure their high-quality standards, they keep the entire manufacturing process in-house. 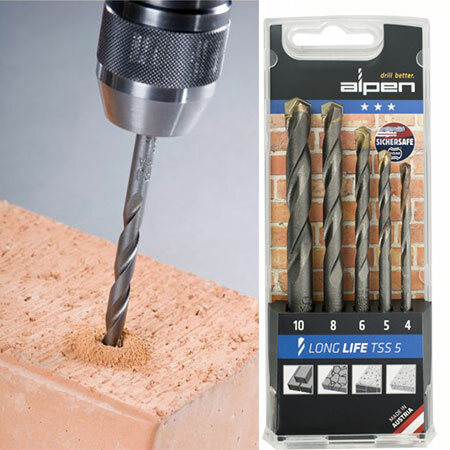 Alpen Long-Life hammer action drill bits are profile milled as with SDS bits and offer a high-performance tungsten carbide drill bit set, they are a stepped profile offering low wear, a very long service life and high efficiency for heavy-duty drilling in concrete, natural stone and brickwork. With unique cutting edges, especially suitable for problem free drilling in concrete and brick, offering vibration free running and fast removal of drilling dust. Like all Alpen products this product is a quality PGM certified drill bit designed for safe anchor fixation, featuring a robust reinforced tool steel core and spiral geometry for high break resistance.